This is a special post for a dear Baesister who has a Birthday. for a dog, she's middle aged now. Pompom is fearless for a small dog, she would bark at a blade of grass shaking suspiciously.She's not noisy, but she will bark at strange things. There is one kind of bark that is different from her other barks...she will bark like that when she sees a snake. It's a short, high pitched bark which is continuous and consistent, until the snake backs off. At one time we had a big hole in the sewer...and a small cobra came in to the side terrace - Pompom's abode - and made it self at home there. Our dog alarm went off...we investigated ... and saw dog and snake facing each other...the snake with it's head upright. My father killed the snake with a broom. The cobra was small...only about fifteen centimeters, about one cm in diameter. A few months later....I just got home when my son shouted, "Pom- pom's fighting with a snake !!" Oh..it was another cobra at the side terrace,and it was BIG !! Pompom was trying to bite the cobra ...and the cobra was trying to bite her !! The cobra won, it bit her on the neck. The snake was killed....it was over one meter, three to four cm in diameter and I'm sure it weighed more than nine pounds !! ...ohh...I've never seen a snake that large outside the Zoo. I took Pompom to an animal hospital. The vet searched for puncture marks but couldn't find any, so she prescribed some antibiotics and analgesics and we went home. The next morning my daughter went out to play with Pompom, she came back and said, " Mom, Pompom's got Mumps..her neck is very swollen and she won't eat. She just sits there with her head bowed ". Oh !! I went out and saw her sitting there sadly, her neck was swollen ...as if she had Mumps. I examined her neck gently, and found two gaping holes in it. We went back to the animal hospital. Pompom was examined again. It turned out she had to be hospitalized and operated on ! I guess the cobra venom had worked it's damage. 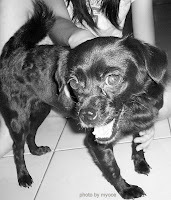 We really felt sad for our little black dog. She stayed there until three days after the surgery.When she came home she was her perky little self again and had this round plastic collar gadget around her neck, which looked like a parabole antenna dish - with a hole in the middle for her neck to go through - so she couldn't scratch the stitches off... ha ha..!! The kids said, "Cool !! she looks like a dog from outer space !!". 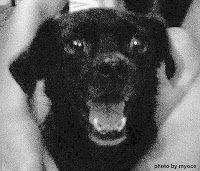 That is the story of our heroine...our small and sweet, brave little black dog. We do love her very much. Still couldn't believe the size of that snake though..errrr.. Yes Hyds...she's so cute and loyal...all of us love her ! Her neck was swollen cos of the venom,probably.. There's a funny story about the snake ...the day after, I was walking in front of our house beside the big gutter along the road,I looked down and screamed ! They stopped and asked us what we were looking at...we pointed...and they both looked down. And the woman screamed..and [can you believe it...] they hurriedly got on their motorbike and drove away !!! Ohh Hyds...the maid and I was laughing so hard !! Haha that was funny but I rememebr when I was young I saw a black snake crawling behind my mum while she was gardening... Oh I was so scared.Thank God mum didn't move. My friend at the moment owns a 9 foot carpet python and placed it in a glass enclosure under the stairs...ohhh I don't think I could do that..
Glad your mom was Ok !